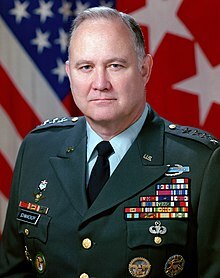 The Miami Herald is reporting that retired Gen. Norman Schwarzkopf has died at age 78 in Tampa, Florida. Gen. Schwarzkopf commanded the U.S.-led coalition that drove Saddam Hussein out of Kuwait in 1991 during the first Gulf War. Gen. Schwarzkopf served as the Ft. Lewis Commander General from 1986 to 1987, in neighboring Washington state.